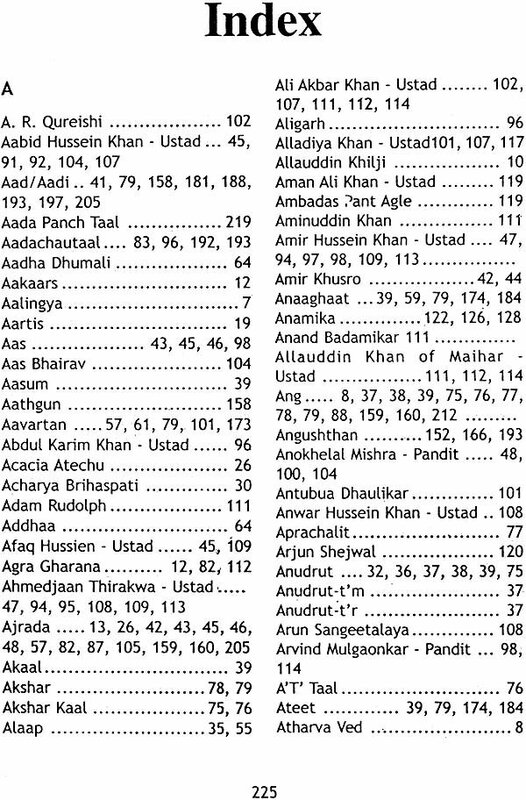 As Ustad Zakir Hussain says in his foreword in the book, there is a lack of definitive, uniform methodology in the teaching of table. Author Sadanand Naimpalli, himself one of the fines maestros in the country today, takes up the challenge in Theory and Practice of Tabla for students of table everywhere. His book will make a student appreciate fully the language of one of the most versatile percussion instruments in the world its grammar, aesthetic, its powerful idioms and the sheer poetry and sophistication when handled by a competent player. The book is in two parts. Part One deals with theory history and terminology of table. 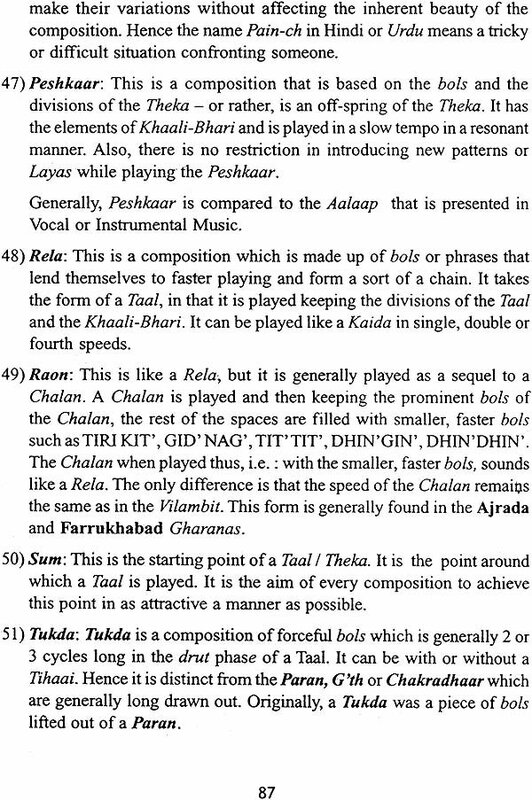 Part Two deals with practice taals and bols. The book presents a comprehensive view of all the different schools and will be useful to beginners ad trained students alike. Sadanand Naimpalli is an engineer by training and a musician by choice. A leading disciple of the legendary Guru Pandit Taranath, he is one of the leading tabla soloists and accompanists in the country today. He is a Top Grade artist of Akashwani and Doordarshan and a winner of several national awards. His workshops and lecture-demonstrations have made him one of the great educators of table. He also plays the pakhawaj. 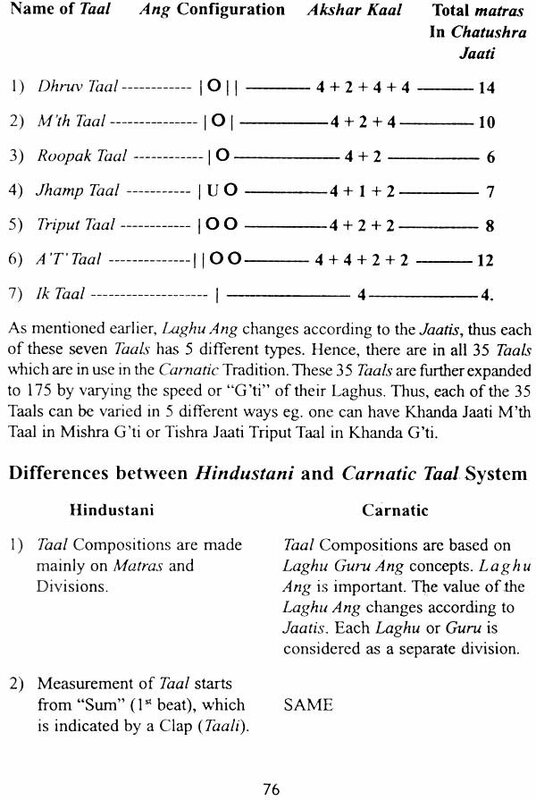 One of the main concerns I have is about the lack of unification in the standardization of the teachings of tabla. Tabla is one of the youngest instruments in the field of North Indian Classical music and is still in the development stage. 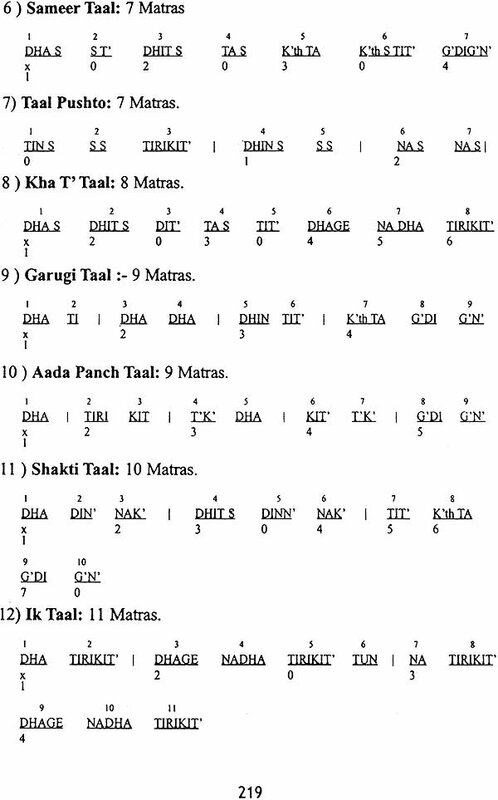 But the repertoire that is played on tabla is a mix of the pakhawaj compositions of the old tradition and compositions that have been recently written for tabla. By recent, I mean the last 150 odd years. The Ustads of the old times were illiterate and believed in the oral tradition of passing on the knowledge, because of that, most of the repertoire [hat was passed on went through subtle changes from generation to generation, both in its execution and its definition. This led to many interpretations of the repertoire creating confusion amongst the students. It is this confusion that Sadanand Naimpalli has very ably addressed in this book. He has not tried to take sides or offer his own opinion as the final one. Instead he has magnified and pointed to a suggestion that although the definitions of the syllabus differ, the basic execution of the compositions remain the same. Mr. Naimpalli received his training from one of the great educators of tabla, Pandit Taranath Rao. 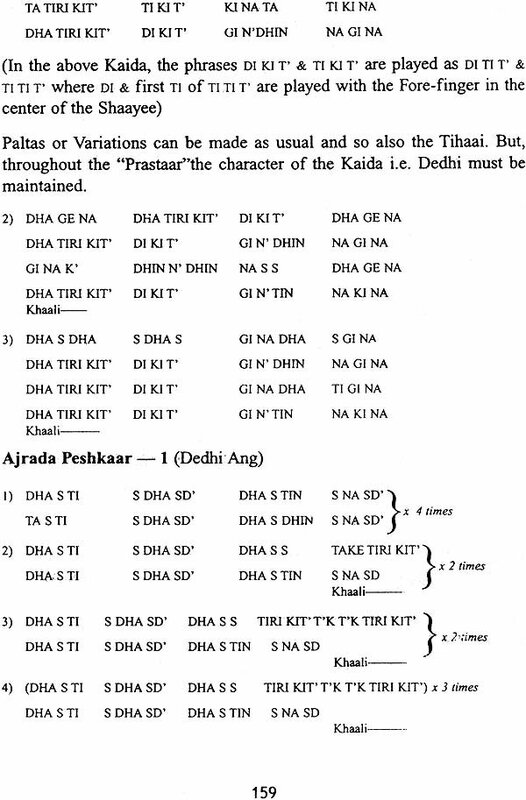 Taranathji's analysis of the repertoire of tabla was based in logic and practicality and this approach is clearly evident in Sadanand Naimpalli's book. Sadanand Bhai is one of the finest tabla maestros of our country. I have heard him do solo recitals of tabla and was very impressed with the way he handled the repertoire of this great tradition. 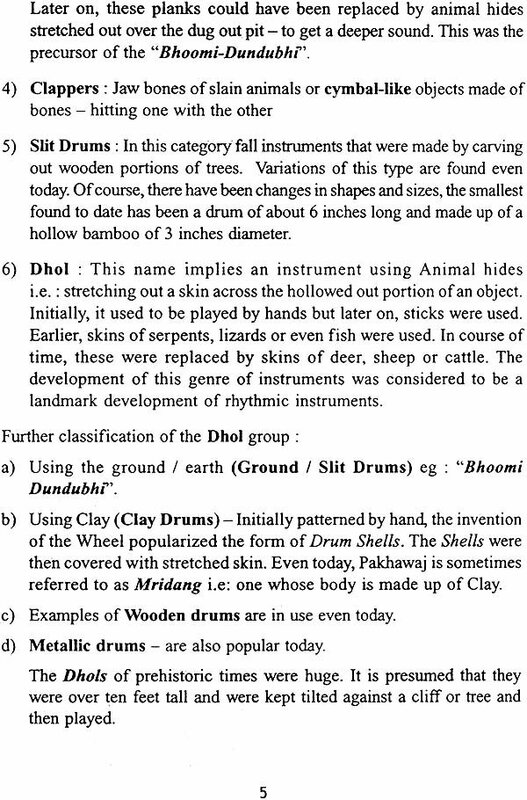 Considering, that this may be the first step towards the way we look at tabla in the future. I wish him well and thank him for giving me the honour of being a part of this endeavour. When I decided to take up Tabla playing again after a lapse of twenty years with my late Guruji's blessings, I realized that I could not sit to play the Tabla for more than five minutes at a stretch. I was hopelessly out of touch. Neither did I have the train of thoughts nor the stamina. When I learnt my Tabla, Guruji just would not allow me to take down the lessons. He made me listen to his recitation of a bol with all the attention that I could muster and try to reproduce it first orally and then on the Tabla. It came to such a stage that I could immediately grasp whatever was taught and reproduce it on the Tabla. Thus, when I needed some sort of reference to start my new innings with the Tabla, I was like a lost kid groping for ideas. At this stage I took a momentous decision. I decided that the best way to get back the forgotten legacy was to start teaching youngsters the same way that I, along with several of my colleagues were taught by Guruji. As I went about doing this, I slowly began remembering all the lessons. Not only did I teach them but I practiced them along with my students. After a few years I realized that I should start writing these lessons for posterity. 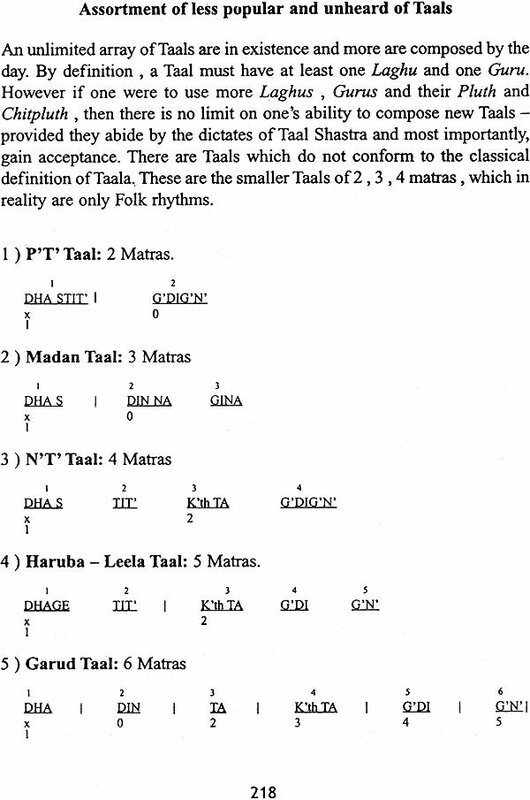 Once the decision was made, page upon page of written Tabla compositions began piling up. Only last year did I feel that it was time I put these things in print. This is the first of my books and is meant primarily for those students who have a strong desire to pursue Tabla as a profession. Being a convent educated person, I found it easier to put my ideas down in English. Also, there were not many books in this language that could be used as a guide by the younger generation. Moreover, the popularity of Tabla has transcended our shores and today, mainly due to the unstinted efforts of my Guruji Pandit Taranathji, Ustad Allarakha Khan, Ustad Zakir Hussein and a host of prominent Gurus, Ustads and popular percussionists, Tabla enjoys a pre-eminent position among all Indian musical instruments both in India and abroad. Tabla has developed as a solo instrument only lately. 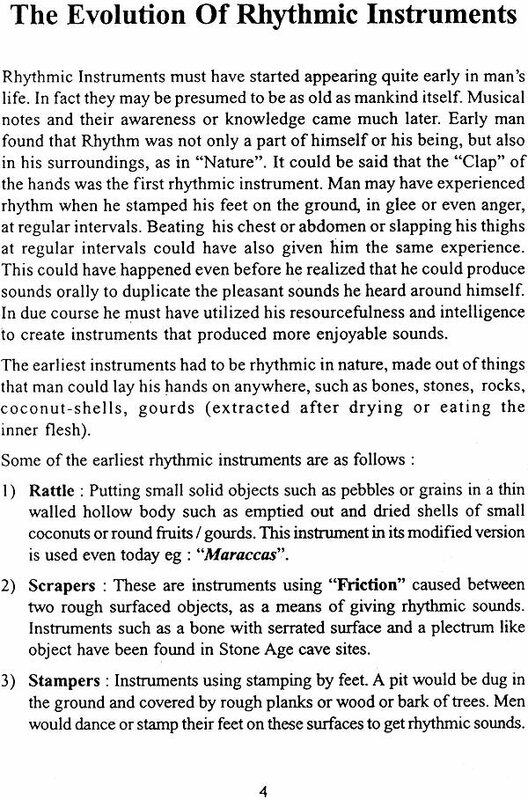 Even today, many musicians are reluctant to consider it as a musical instrument. Neither are they inclined to learn more about it, preferring to make themselves aware of only those Taals and Thekas that are useful to them. 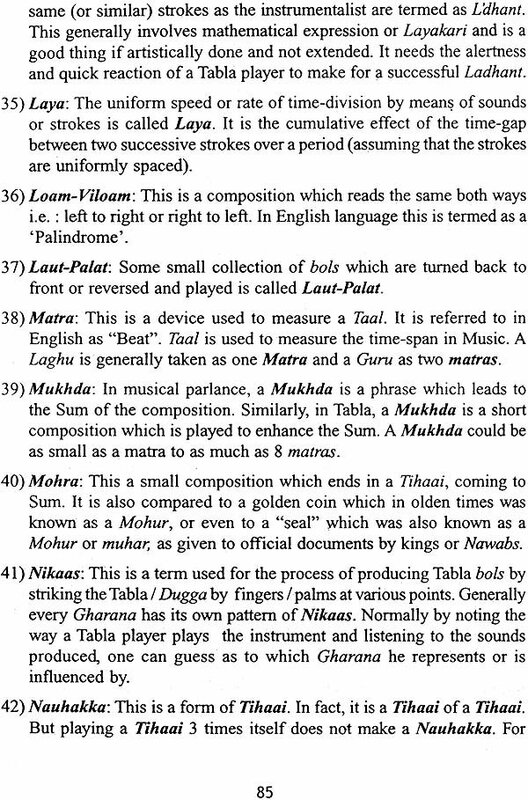 Tabla has its own language- grammar, aesthetics, prose, poetry, in fact everything that is associated with any language. Only, the mode of expression is different. Why is Tabla considered the most popular accompanying instrument today? Obviously, because of the wide range of pleasant sounds and its ability to blend with the vocalist's or instrumentalist's idiom. Be that as it may, the scope of this book is to present Tabla as a Solo instrument. 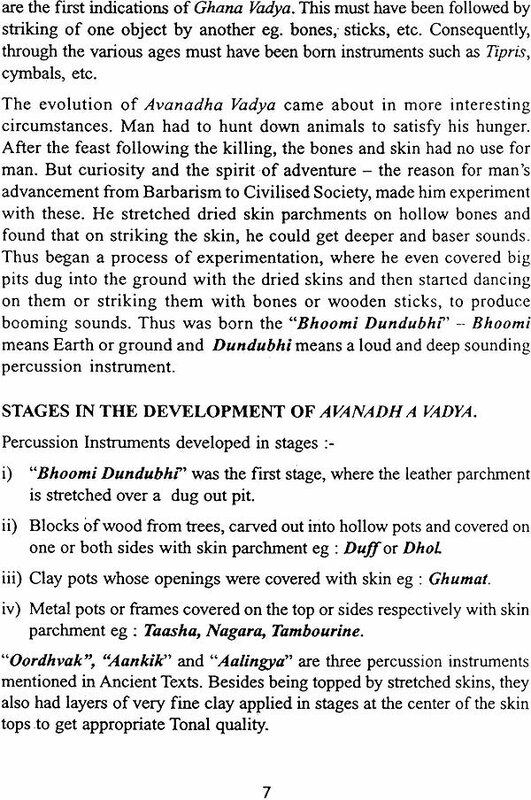 The language of Tabla has developed from that of its more ancient predecessor, Pakbawaj. However, there is a wider range of sounds and bols, mainly because of the separation of the Bass and Treble i.e. 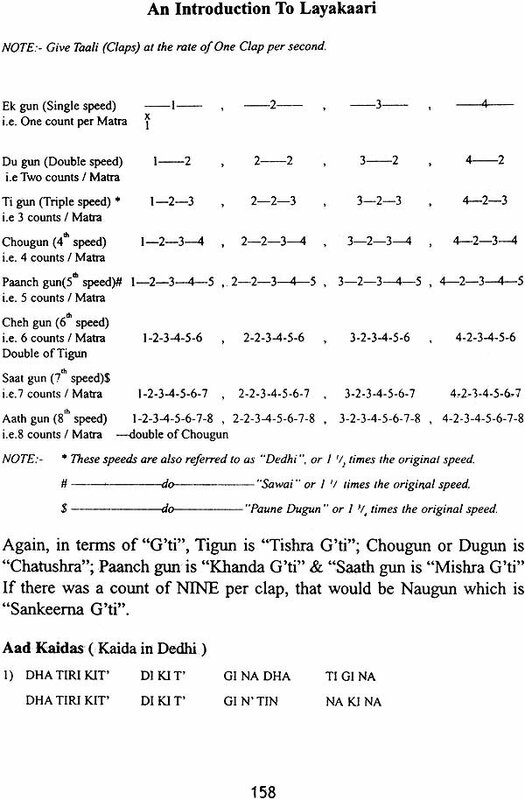 Dugga (Baayaan) and Tabla. 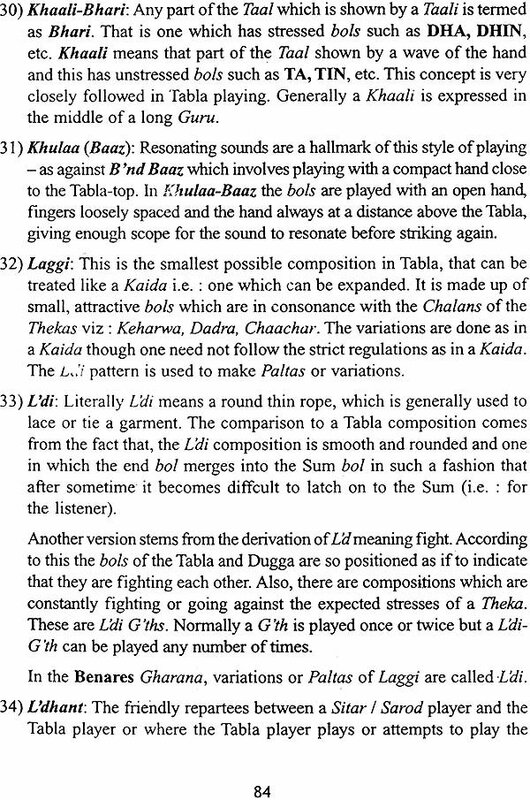 Also, the Tabla lends itself efficaciously to a range of styles of singing and instrumental accompaniment. 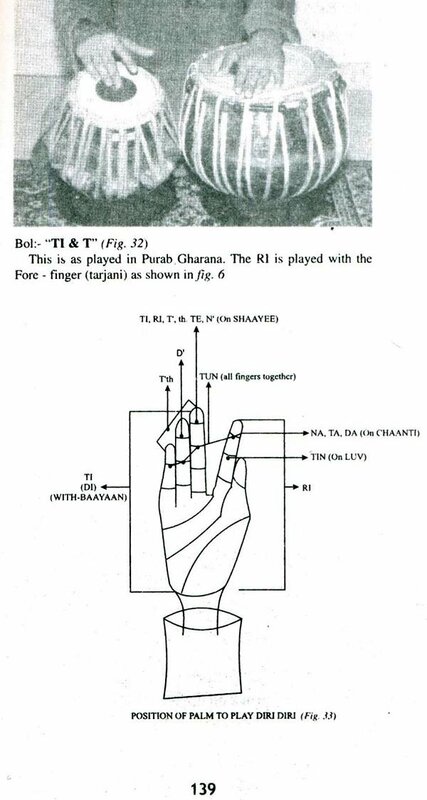 Tabla, as is the case with all musical arts, is mainly a "Gurumukhi- Vidya" i.e. knowledge passed to a' Shishya from the mouth of a Guru. 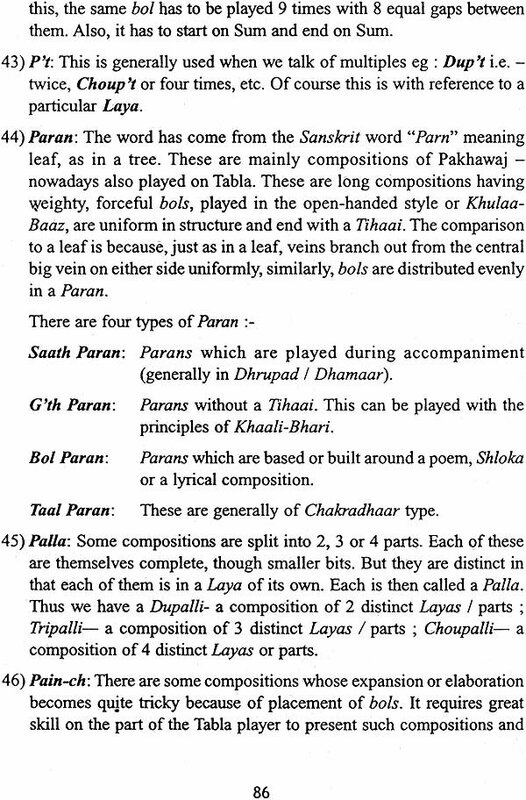 Even today, there are some discrepancies in definitions and presentation of compositions depending on which "Gharana" or school of Tabla one represents. Seminars and Conferences are' held at regular intervals to discuss and narrow the differences and bring about a consensus so that a uniform methodology is evolved for future dissemination of knowledge of Tabla. 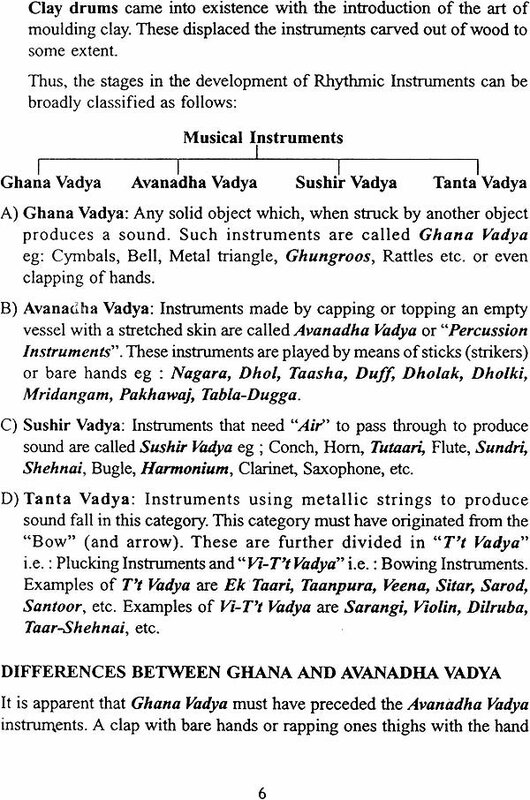 It has been my effort to present as comprehensive a view of Tabla in all its diversity in so far' as various "Gharanas" are concerned. The material given should cater to any student, from a rank beginner to a Tabla player who is already trained to some extent. 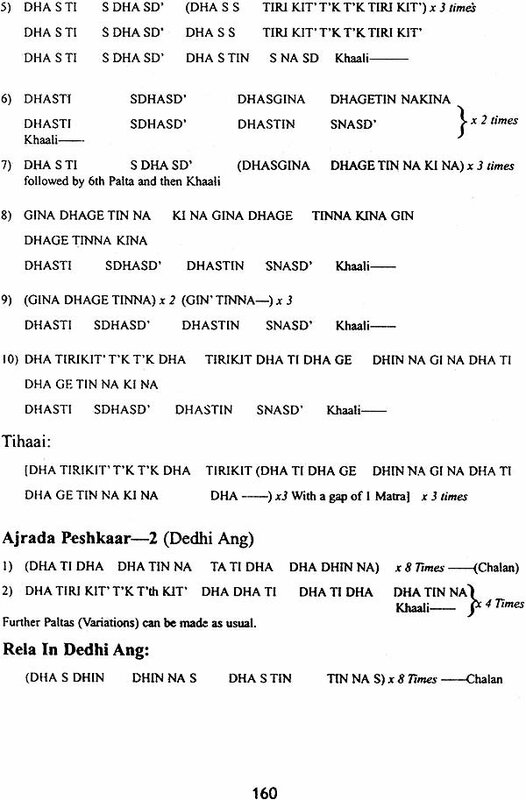 Besides "Dadra", which is mainly for beginners, nine more Taals have been .dealt with, such that each can be presented in a Solo of about half an hour. Of course, Teen Taal has been dealt with in greater detail. 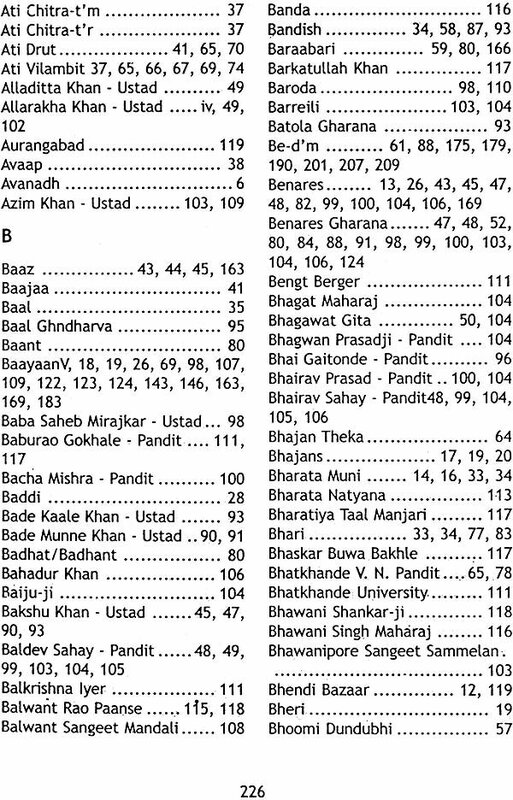 There is enough scope for an enterprising student to try and make his own permutations and combinations of various Kaidas Relas etc. I intend to bring out a sequel shortly, wherein the Taals covered here are dealt with in greater detail and some more Taals are added to a performer's repertoire.